The ongoing and intensifying state crackdown in China, increasingly targeting left activists and critics, is highlighted by the case of 24-year old Zhang Shujie, a supporter of the Committee for a Workers’ International (CWI). Zhang is a socialist and advocate of independent trade unions and workers’ rights in China. He is a contributor to the chinaworker.info website and a supporter of the CWI, which has members and supporters in many countries including China, Hong Kong and Taiwan. Since 2009, Zhang has been a correspondent for the chinaworker.info site and for the bi-monthly magazine, Socialist. Both the website and the magazine are banned in China. In February 2011, Zhang became one of countless victims of the latest wave of repression in China, driven by the Beijing dictatorship’s fear of revolt following the fall of the dictator Mubarak in Egypt and the explosion of revolutionary struggle across the Arab world. The plight of left activists in China, who are increasingly targeted by the regime, is almost never reported by the capitalist media globally, which prefers to focus on cases involving liberals or pro-Western dissidents whose ideas are more to their liking. In October 2011, Zhang managed to leave China, evading his police ‘minders’ with the help of friends and comrades in the CWI and others, in China, Hong Kong and Europe. These include parliamentarians Joe Higgins and Paul Murphy of the Socialist Party (CWI) in Ireland, and ‘Long Hair’ Leung Kwok-hung, legislator for the LSD in Hong Kong. Had Zhang remained in China he risked a long period of detention, with state security agents threatening he could be charged with “divulging state secrets” and “inciting subversion against state power”, which is punishable by ten years imprisonment. These charges are commonly brought against dissidents in China today. The definition of “state secrets” is very broad, covering for example the questioning the government’s version of the number of schoolchildren killed in the 2008 Sichuan earthquake, to the amounts of foreign currencies held in China’s reserves. Zhang is currently in Sweden, where his case will be discussed at a hearing in the Swedish Riksdag (parliament), on human rights and state repression in China, at the end of January. Zhang was called to a meeting with state security agents in the city of Chongqing on February 24, 2011. This was at the start of a large-scale pre-emptive crackdown in China to snuff out discussion of a ‘Jasmine Revolution’ inspired by events in the Middle East and North Africa. Zhang was not allowed to contact a lawyer or to inform his family. Security agents said they ‘knew everything’ about his activities and told him he could be detained indefinitely, i.e. ‘disappeared’, unless he gave them information about everyone he had met or been in contact with, ‘confessed’ his links with the CWI, and agreed to ‘cooperate’ with the security forces. Such methods are typical for the state security forces in China. When Zhang was first taken for interrogation he was held for 28 hours during which time he was made to stand, deprived of his spectacles and refused food for several hours. Despite the fact that he was never formally charged with an offence, his computer, mobile phone and bank documents were seized and examined for evidence. He was warned he could face several years imprisonment for ‘contact with a banned organisation’ and for ‘crimes relating to state security’. He was told that he could avoid this fate if he ‘cooperated’ with the security forces. With no alternative, Zhang agreed to their demands. Unknown to police and against their explicit instructions, he contacted CWI comrades to seek advice and help. In the following months the state security officers read correspondence between Zhang and his comrades, instructing him on how to reply. They urged him to volunteer to attend meetings in Hong Kong, which they would pay for. They gave detailed instructions that he should photograph meeting participants and other activists with his mobile phone and collect personal information. 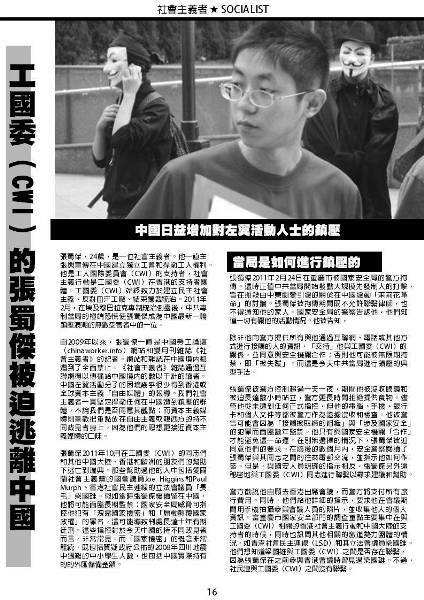 While the main focus of their enquiries was the CWI-linked group Socialist Action and mainland China CWI supporters, the Chongqing state security department also quizzed Zhang about this groups’ ties with other radical forces such as the League of Social Democrats (LSD) and legislator, Leung Kwok-hung. They wanted to know if there was a possible link-up between the CWI and Leung, whom Zhang has met during previous visits to Hong Kong. LSD is a radical pro-democracy group which is not connected to the CWI. As a separate legal and juridical entity, China’s police and courts have no writ inside Hong Kong. According to Hong Kong’s ‘Basic Law’ (mini-constitution) its citizens’ rights to political association are legally protected and the mainland state authorities have no formal powers to interfere with or monitor these activities. This means that the Chongqing branch of state security instructed Zhang, under threat of imprisonment, to engage in ‘unconstitutional’ activities in Hong Kong. These security officials subsequently paid for Zhang’s visit to Hong Kong to attend a CWI meeting in October 2011, and gave instructions to collect information on political activists in the city – including an elected member of Hong Kong’s legislature. Zhang had no intention of carrying out the regime’s dirty work. He made arrangements with CWI comrades and supporters to leave China, during his visit to Hong Kong. This case exposes the brutal and lawless methods of the Chinese dictatorship despite its efforts to project a more sophisticated image. Foreign governments and the multinational companies whose interests they hold closest to heart have largely dropped any criticism of human rights abuses and the Chinese regime’s increasingly repressive rule. Those who have dared to challenge this repressive system and paid the price for this deserve the support and solidarity of all left and democratic forces. 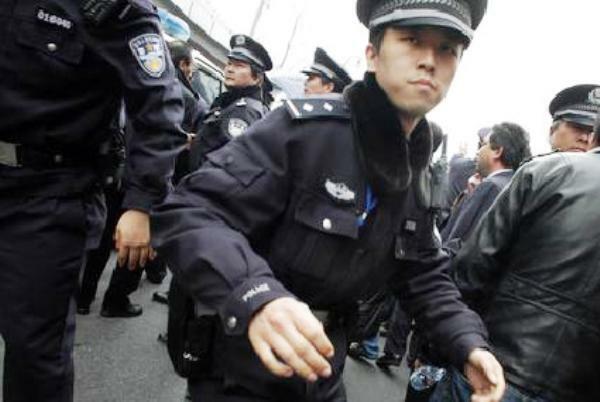 Today, China is experiencing the most severe police crackdown for more than a decade, a process that Amnesty International has described as ‘chilling’. Hundreds of writers, lawyers and activists have been rounded up and ‘disappeared’ by police. The targeting of high profile individuals such as artist Ai Weiwei and activist lawyers such as Gao Zhisheng, has been used to warn others and underline that nobody is untouchable. Within this wider crackdown, the targeting of prominent activist lawyers, those who have defended other victims of repression, has dealt a huge blow to any suggestion of an independent legal system emerging in China. In the final days of 2011 several court verdicts dispelled any suggestion of a let up in the crack down. Sichuan-based writer Chen Wei was sentenced to nine years in prison for ‘subversive writing’ and Guizhou-based Chen Xi was given a 10-year sentence, also for “inciting subversion” in trials either side of Christmas Day. Another high profile dissident, Ni Yulan is currently on trial in Beijing for “making trouble” due to her role in defending victims of land grabs and could also face a draconian sentence. Last year, China’s internal security budget ballooned to 624 billion yuan (US$95 billion), exceeding its military budget. The influence of hard line proponents of repression within the regime has been strengthened. With a crucial leadership and governmental succession due to occur in 2012, and amid severe economic challenges that could trigger social unrest, the current regime has effectively given carte blanche to the security forces to write their own rules in subduing potential opposition voices. Security forces have made increasing use of forced disappearances, secret detentions and other ‘extra legal’ measures effectively shifting the parameters as far as China’s already limited legal rights of expression are concerned. “Such acts are carried out in more and more blatant ways, with officials abandoning even the pretence of obeying the law,” noted Amnesty International in a June 2011 report. New and more intrusive internet controls, plans for the world’s biggest security database to boost social controls, and tough new restrictions on ‘weibo’ micro-blogging sites, which have become a popular means of exposing official abuses and reporting mass protests, are all part of the same pattern of increased authoritarian controls. 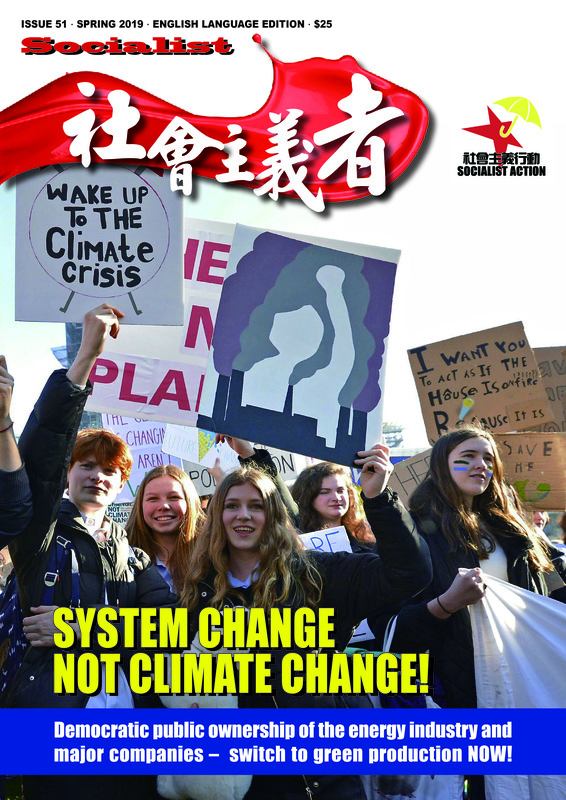 Recent years have seen a marked upswing in left wing and anti-capitalist ideas in China, similar to processes internationally, where growing numbers of young people especially are rejecting the capitalist market system in the light of the global financial crisis and widening inequality. Previously, the Chinese regime did not pay much attention to left critics, believing that liberal and ‘pro-Western’ influences represented its biggest political threat. This began to change decisively in and around 2008, and the state security’s monitoring and attacks on left groups and individuals has increased significantly. Maoists, ‘New leftists’, Trotskyists and others who stand up for workers’ rights, especially those who advocate independent organisations for working people, have been detained and in several cases brought to trial for ‘inciting subversion’, ‘violating social order’, and similar charges. Several of these cases have been reported on chinaworker.info. Zhang Shujie’s political activity, and the activity of other CWI supporters in China, is of a literary nature. He has written and translated articles for the chinaworker.info website and ‘Socialist’ magazine (the magazine is circulated as an underground e-magazine inside China with the help of many courageous individuals). 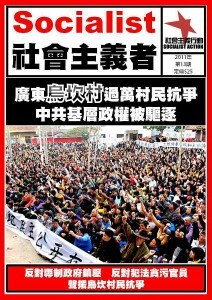 Chinaworker.info, which was set up by CWI members in 2004, has aroused the ire of the Chinese dictatorship. The website and CWI supporters have organised solidarity actions in several countries in support of workers’ strikes against sweatshop conditions. They have also staged protests to publicise the cases of arrested activists. In China the supporters of the CWI network with labour activists, migrant rights advocates, LGBT activists and others whose beliefs and political activity force them to cross the line into ‘illegality’ in China. Several young workers and students with links to chinaworker.info have been arrested over the last three years, in circumstances similar to the case of Zhang Shujie. In 2009, a book published by chinaworker.info in Hong Kong, dealing with the twentieth anniversary of the 1989 Beijing massacre (‘Tiananmen – Seven Weeks that Shook the World’ ISBN 978-91-633-4709-2) was banned in China. This book was listed by the government as one of the top five ‘illegal political books’ of the year, alongside ‘Prisoner of the State’ the memoirs of former Communist Party leader Zhao Ziyang. Local governments and post offices were instructed to hunt down copies of the book. Zhang Shujie, writing anonymously, was one of the contributors to this book. In October 2009, CWI member Laurence Coates, a founder of the chinaworker.info website and another of the authors of the banned ‘Tiananmen – Seven Weeks that Shook the World’, was refused entry to China. He was accused by Chinese officials of being a “potential threat to national security”. No amount of repression can save a totalitarian regime once the people lose their fear, a process that is already underway in China. With the economy lurching towards crisis, a bursting property bubble and unprecedented levels of debt, the misnamed ‘communist’ dictatorship has every reason to dread the future. The intensified surveillance and attacks on left critics – including CWI supporters – shows the powerful potential for genuine socialist ideas in China. These ideas can be summarised as: immediate and full democratic rights, the end of single-party rule, free elections to a revolutionary constituent assembly, a workers’ and poor farmers’ government, big increases in basic wages and a maximum 8-hour working day, free public healthcare and education, and democratic public ownership of the biggest companies and banks. The case of Zhang Shujie and thousands like him underlines the need to step up the struggle against state repression in China, to demand the release of all political prisoners and an end to police terror. To this end, the CWI is preparing to launch a major campaign in support of victims of persecution in China, and especially socialists like Zhang. 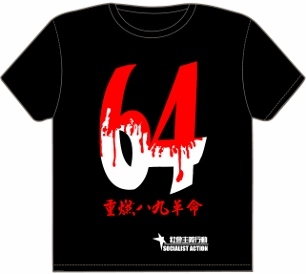 This campaign will include solidarity actions, appeals for donations, and protests against the Chinese state’s repression.